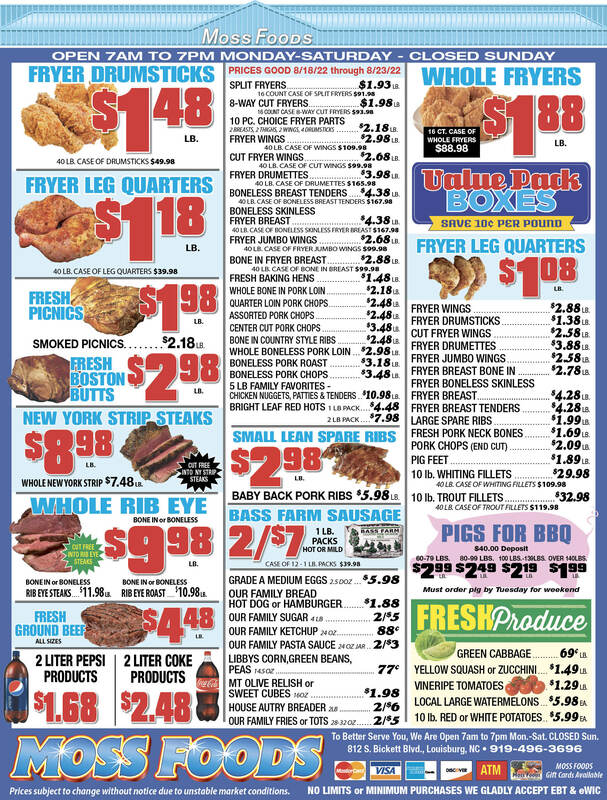 Showing 51 articles from May 14, 2014. Franklinton man killed; robbery attempt gone bad? FRANKLINTON — Police are looking for suspects in a homicide — the town’s first since 2010. Officers responded to the area of Church and Hawkins streets about 10:15 p.m. on May 13 after someone reported they heard gunshots. Officers arrived to find David Lee Wilkins Jr. lying in the yard of a home on Church Street, dead from a single gunshot wound. 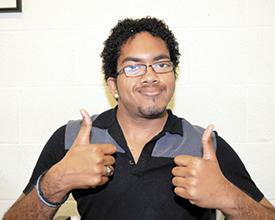 Two thumbs up and a broad smile that lights up a room could only mean one thing — James Kearney just hit another milestone in his life. 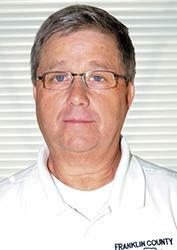 But whatever title Franklin County’s Tim Gilliam prefers, it’s clear his career closely mirrors the Franklin County Medical Services organization over the last three-plus decades. Back in 1977, Franklin County began its first salaried, full-time Emergency Medical Services organization, which became known as Franklin County EMS. 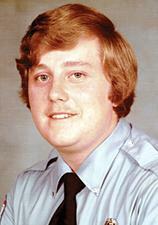 The early days of emergency medical services in Franklin County were more of a “family affair” than today, recalls Tim Gilliam’s wife, Janice. She said she and the couple’s three children spent a lot of time in those early years hanging around the EMS building in Louisburg, just as did other families of those who worked 24-hour shifts. YOUNGSVILLE — A woman who formed the SPCA of Franklin County and was part of its rejuvenation apparently won’t be part of its future. Board members confirmed this week that Rebecca Rodgers is no longer affiliated with the volunteer group committed to animal welfare. It seems like just a few months ago that I first met James Kearney when he was a shy, reserved senior at Louisburg High School who was about to receive his diploma. That meeting resulted in a page 1 feature story in this newspaper that explained the challenges this young lad had faced after being born deaf, “crippled” (his word, not mine) and unable to speak. Government is all about choices. It’s about being willing and able to make the tough decisions. All of those factors are brought into sharp focus about this time of the year in North Carolina as local governments — and the state government — begin to finalize their budgets for the coming year. May 13 concluded one of the wildest elections I’ve ever had to cover. It would be easy to say so what to that statement, given that I’ve only been covering elections as a reporter since 1998. However, during this most recent campaign, which seems to stretch back an eon, I have spoken to many people with a bit more experience than I have and they agree — this primary election has been strange. This week is something a little different: Paper Bullets hosts commentary from guest writer Jeremy Neal, chairman of the Franklin County Republican Party. Neal’s accomplishments are many, too many to list. He’s a lifelong resident and has contributed greatly to our community. 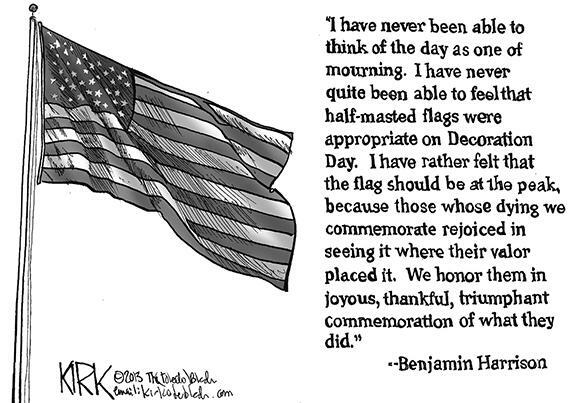 In large part, America was founded in protest of taxation without representation. Our forefathers risked, and in some cases lost, their lives so we could vote. That battle didn’t end with the Revolutionary War. Not all adult Americans had the right to vote at the end of that war or some year later when our Constitution was adopted. BUNN – Carol Ann Nichols Williams, 67, died Friday afternoon, May 9, 2014 at her home. A funeral mass was held Tuesday, May 13, at Our Lady of the Rosary Roman Catholic Church. 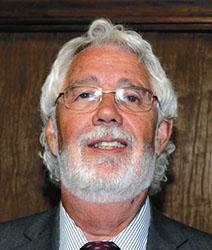 LOUISBURG – Gerald Lee Stanton, 67, died Friday evening, May 9, 2014 at Wake Med. A funeral service will be held 11 a.m. Friday, May 16, in the chapel of Strickland Funeral Home. Burial will follow in Oakwood Cemetery. The family will receive friends one hour prior to the service. LOUISBURG - Memorial services for Kaye Francois, 72, who died Saturday, May 10, 2014, will be held at 2 p.m. Saturday, May 17, at Kingdom Hall of Jehovah’s Witnesses, with Brother Kyle Donaldson officiating. FAYETTEVILLE – Leonard James Groves, 82, died Monday morning, May 12, 2014. A graveside service will be held at 3:30 p.m. Thursday, May 15, at Cumberland Memorial Gardens. 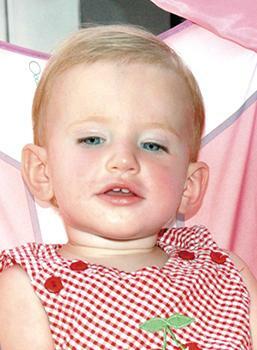 The family will receive friends 11 – 12 p.m. Thursday at Strickland Funeral Home & Crematory, Louisburg. FRANKLINTON —Willie Bert Pender, 79, died Friday, May 2, 2014. Funeral services were held Friday, May 9, at First Baptist Church in Franklinton. A FIRST FOR FHS. 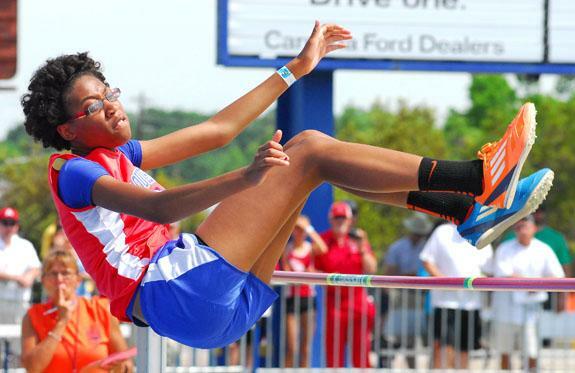 Charity Snelling became Franklinton High School’s first-ever state champion in any sport when she won the Girls High Jump event last Saturday at the Class 2-A State Track and Field Championships in Greensboro. FRANKLINTON -- If anyone knows the story of Franklinton High School never producing an individual or team state champion in any sport, it’s Charity Snelling. Ever since she arrived at Franklinton as a potential-rich freshman, Snelling had heard about that fact -- and she was groomed to help bring a long-lost state title banner to the FHS Gymnasium. FLIGHT PLAN. Louisburg’s Vanisha Wilshire takes off during Girls Long Jump competition at last Friday’s Class 1-A State Track and Field Championships, which were staged at Aggie Stadium in Greensboro. 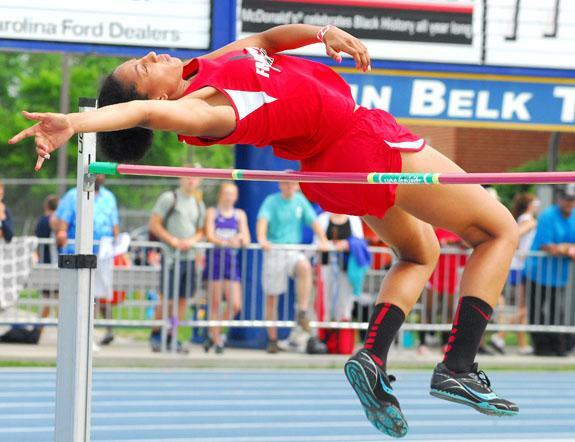 GREENSBORO -- It takes a special athlete to undertake two events at the same time at the Class 1-A State Track and Field Championships -- let alone three. That was Vanisha Wilshire’s challenge -- both mentally and physically -- at last Friday’s state meet as she was competing in the triple jump, high jump and discus all at once. AND THE WINNER IS. 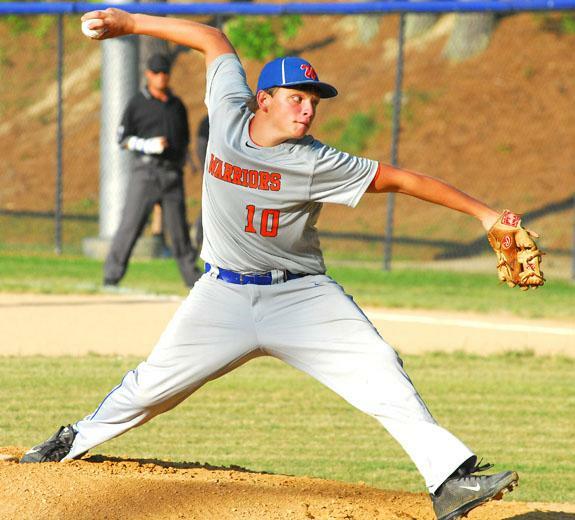 Louisburg High School’s Casey Gupton earned the mound decision Tuesday night against Franklin Academy in the playoffs. 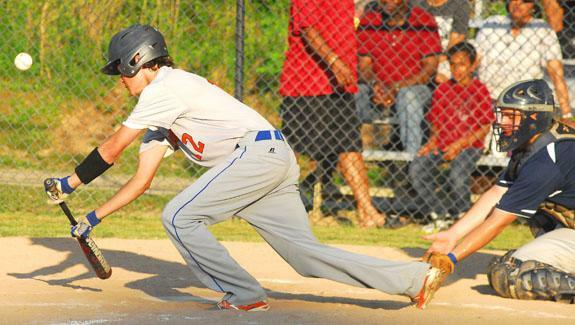 LOUISBURG -- Louisburg High School baseball coach Al Bolton had a bit of a dilemma heading into Tuesday’s opening-round contest with Franklin Academy in the Class 1-A State Baseball Playoffs. LHS had beaten the Patriots twice during the regular season, so Bolton knew his club would enter the event with plenty of confidence. A TRUE SACRIFICE. Bunn’s Kristy Green executes a bunt during the Ladycats’ crucial home victory last Friday against the Roanoke Rapids Jackets. 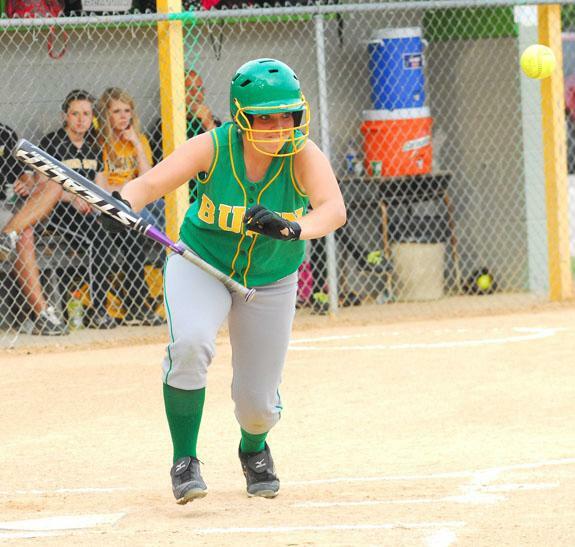 BUNN -- A pair of perennial fast-pitch heavyweights will joust for postseason survival this Friday at the BHS Softball Field. That’s when host Bunn will entertain Washington at 6 p.m. (weather permitting) in the second round of the Class 2-A State Playoffs. 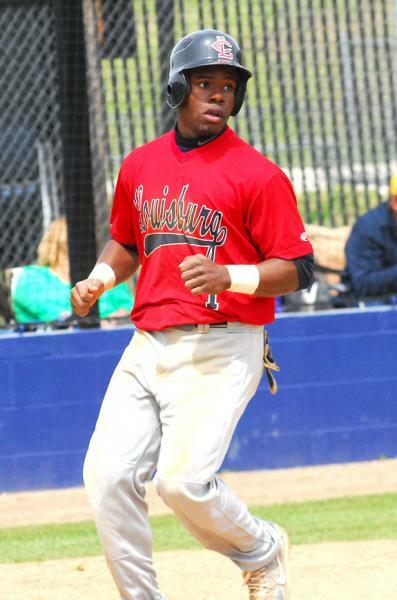 LOUISBURG -- It was quite a year on and off the baseball diamond for Louisburg College sophomore outfielder Cedric Mullins. Mullins’ heroics for the Hurricanes -- along with his 4.0 grade-point average -- helped him earn LC’s Male Student-Athlete of the Year Award. But that wasn’t the end of the accolades as Mullins was also tabbed as the Region X Player of the Year. TWICE AS NICE. 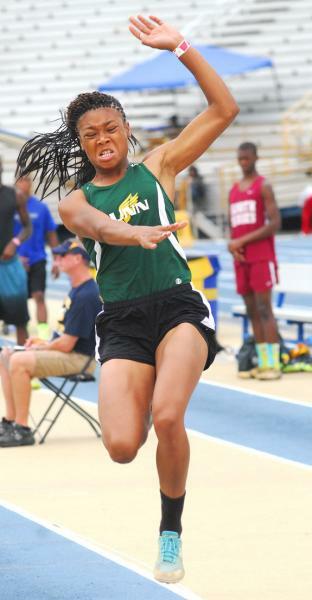 Bunn’s Tainasha Vines took first place in both the Girls High Jump and Triple Jump at the Class 2-A State Meet. GREENSBORO -- For the past three years, Franklin County has enjoyed a girls track and field renaissance behind the ‘Big Three’ of Franklinton’s Charity Snelling, Louisburg’s Vanisha Wilshire and Bunn’s Tainasha Vines. The high-profile performers have become pals and friendly rivals, often supporting each other at their respective meets. STEM -- Needing a victory to earn a share of the Tar-Roanoke Athletic Conference regular season softball championship, the Louisburg Lady Warriors came up with their biggest rally of the year last week at Granville Central. The home team, which had defeated LHS less than one week earlier, seemed on the cusp of an outright title, but the Lady Warriors scored three times in the top of the seventh frame for an electrifying 6-4 conquest. WIN IT. Bunn’s Haley Jones (left) tries to claim a ball during her team’s home soccer match last Wednesday evening against Northern Carolina Conference opponent Durham School of Arts. 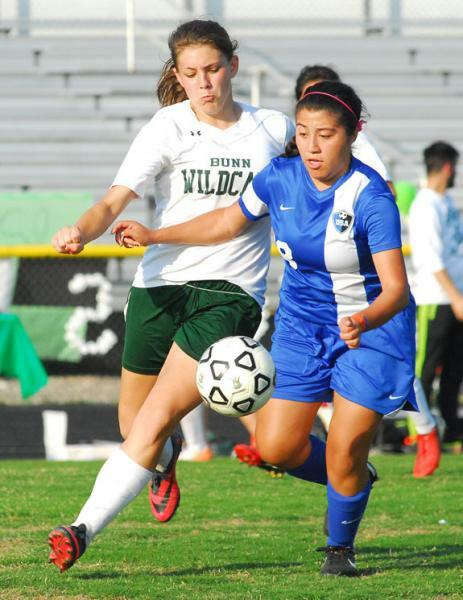 BUNN -- After suffering a 3-1 loss to Durham School of Arts as part of last Wednesday’s Senior Night, it was generally considered that the season had come to a close for the Bunn High School girls soccer squad. But that would not be the case as the Ladycats, with a 5-14 overall record, were able to secure a wild-card position for the Class 2-A State Playoffs. FRANKLIN COUNTY -- The Franklin County Royal Knights will conduct the Elite Roundball Classic Basketball Tournament on May 31-June 1 at the Soldier Memorial Sport Complex in Butner. Divisions wil be in grades 4-12 for boys, along with middle school girls. The entry fee is $125. RAFAEL IS RIGHT ON TARGET. 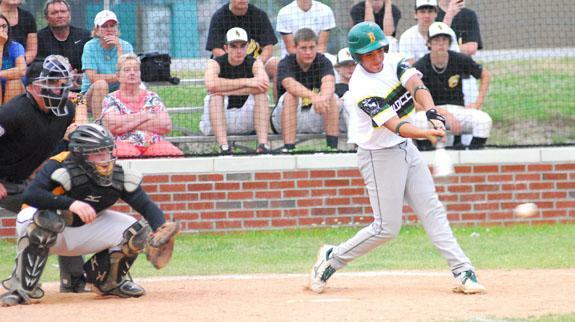 Bunn’s Rafael Ortega rips a single for the Wildcats during their home victory last Friday night against Northern Carolina Conference opponent Roanoke Rapids. BUNN -- After witnessing Bunn’s unexpected loss in the first round of last year’s baseball postseason, Coach Chris Cullom decided to take a much different tact this time around. “Last season, we discussed the playoffs pretty much all year long,’’ said Cullom, who was then an assistant to Leonard Allen. “This year, we decided not to even talk about the playoffs, and we haven’t. We have just tried to treat it like another game. ZEBULON -- A ninth-inning comeback fell short as the Carolina Mudcats dropped a heavyweight struggle to the Lynchburg Hillcats 11-8 on Monday night in a Class A Carolina League baseball contest at Five County Stadium. The Mudcats dropped to 18-16 overall and Lynchburg improved to 16-19. Cole Sulser (0-4) absorbed the loss after allowing eight runs on eight hits (six earned) with one walk and one strikeout in 2.2 innings. 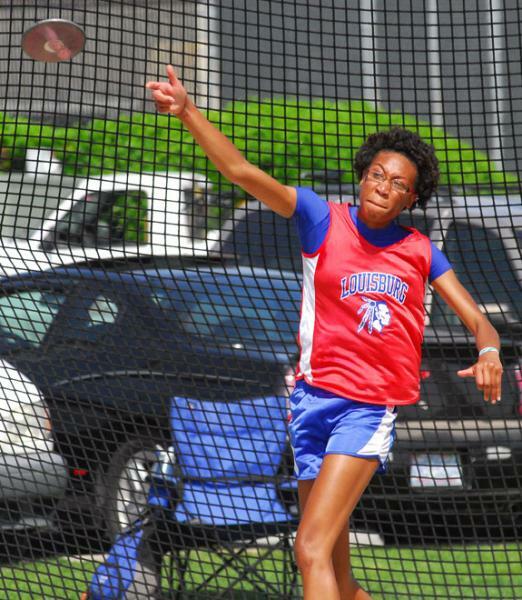 Louisburg High School’s Vanisha Wilshire unleashes a discus toss during last Friday’s action at the Class 1-A State Track and Field Championships at Aggie Stadium in Greensboro. Louisburg’s Jake Murphy attempts a sacrifice bunt for the Warriors during their home victory Tuesday evening against Franklin Academy in the Class 1-A State Baseball Playoffs. 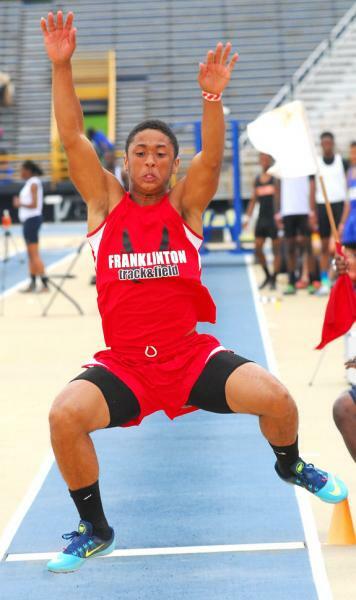 Franklinton’s Malike Tarbell competes in the Boys Long Jump event at the Class 2-A State Track and Field Championships. 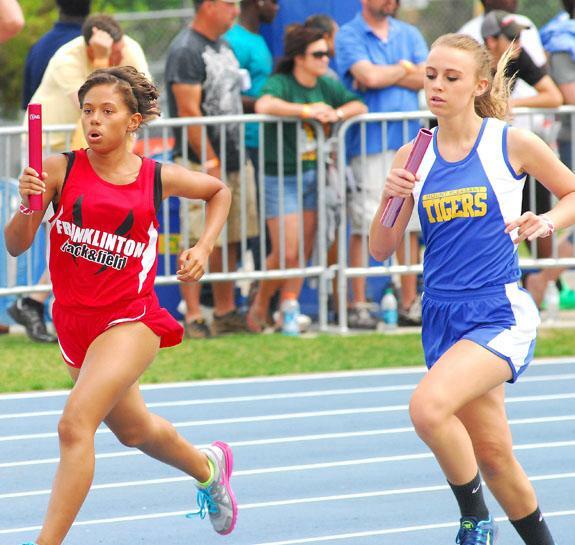 Franklinton High School’s Tasia Lynch (left) makes a strong sprint in the Girls 3200 Relay as part of the Class 2-A State Track and Field Championships last Friday in Greensboro. 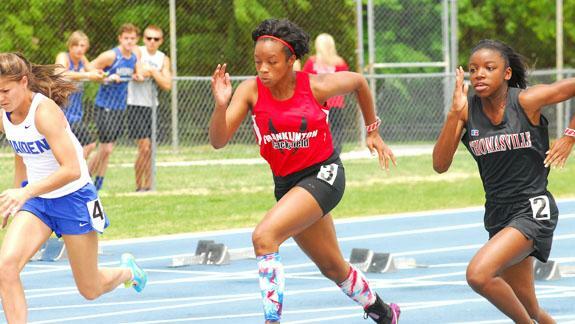 Franklinton High School freshman Shaniece Jones-Thames (center) gained valuable experience by taking part in the Girls 100 at the Class 2-A State Track Championships. 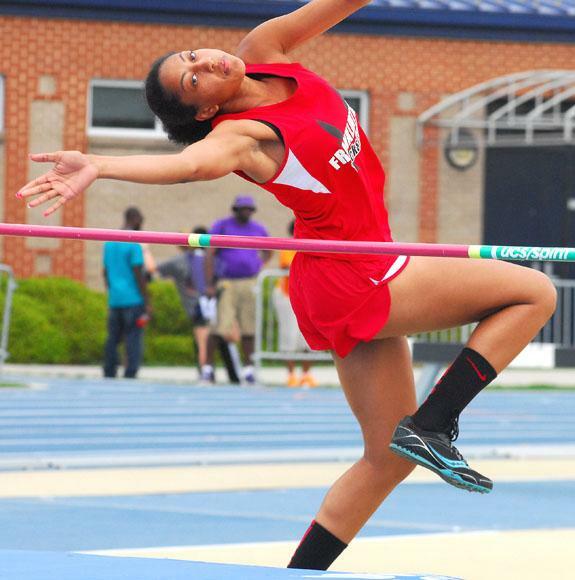 Franklinton’s Charity Snelling won the Girls High Jump with this attempt at last Saturday’s Class 2-A State Track and Field Championships at North Carolina A&T State University. 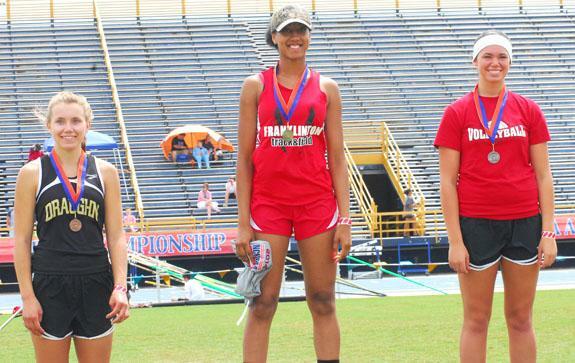 Franklinton’s Charity Snelling (center) is all smiles after receiving her first-place medal. 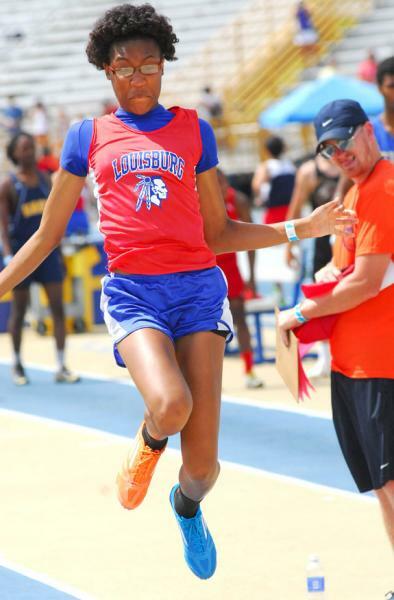 Louisburg High School junior standout Vanisha Wilshire earned second place in the Girls High Jump event as part of last Friday’s Class 1-A State Track and Field Championships. In North Carolina and across the country, 2014 will mark the 100th anniversary of Cooperative Extension programs. Extension’s centennial is linked to the signing of the federal Smith-Lever Act, which provided funds for life-changing educational programs. Today, Cooperative Extension programs in North Carolina are based in all the state’s 100 counties and on the Qualla Boundary of the Eastern Band of the Cherokee Indians. 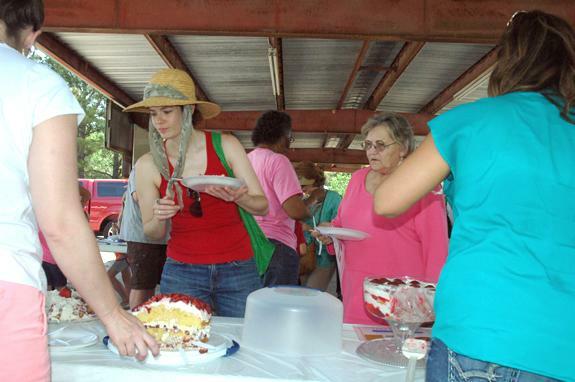 Josie Smith, center, left, and Carolyn Franklin, center, right, eye some desserts during the annual Strawberry Festival hosted by the Franklin County Cooperative Extension. The May 9 event featured a cooking contest, provided visitors with agriculture information and made free strawberry ice cream available at the Farmers Market in Louisburg. 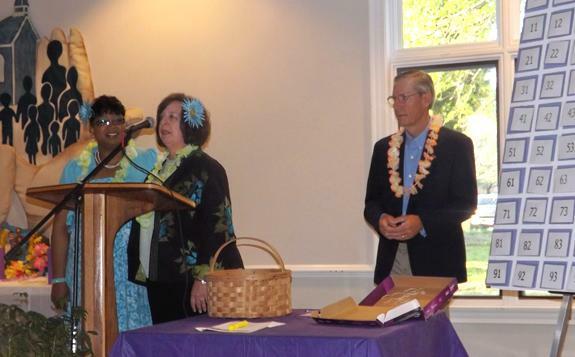 Safe Space Inc. held its 12th Annual Reverse Raffle Fundraiser RECENTLY at Louisburg United Methodist Church. Guests purchased $100 tickets admitting two people and enjoyed an “Island Breezes” dinner. The event raised nearly $14,000 that Safe Space will use to serve local victims of domestic violence and their children by providing shelter, advocacy counseling and community education services. Taylor Erin Williams has been awarded a $500 educational award in a national competition with other students who are members of Modern Woodmen of America. Modern Woodmen, a fraternal benefit society offering financial services, has local representatives and is based in Rock Island, Ill.
Williams, the daughter of Susan D. Beasley, Youngsville, plans to use the grant to attend North Carolina State University. LOUISBURG — About two dozen people showed up for a town hall meeting this week, including residents and environmentalists concerned about water quality, officials worried about cleanup costs and representatives of the company responsible for a 39,000-ton coal ash spill. State Rep. Bobbie Richardson arranged for the May 13 meeting, giving all interested parties a chance to learn more about the incident, the state of our drinking water and Duke Energy’s efforts to solve the problem. Board of Elections officials certified the primary election this week, an action that produced no significant changes from the May 6 unofficial results and won’t require a recount in the closest county race. The official tally from the May 6 election produced a win for incumbent Clerk of Court Patricia Burnette Chastain, who earned 3,316 votes to the 3,211 ballots cast for Shelley Dickerson. 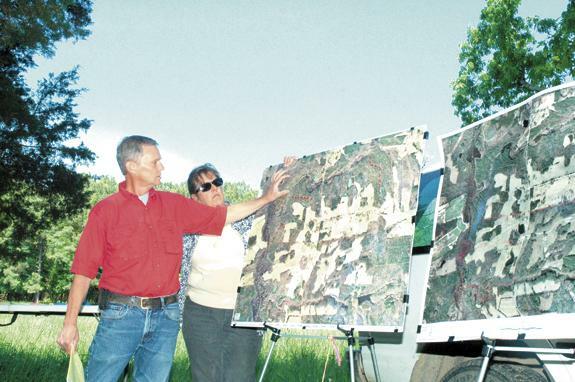 From left, Fred Harris, a subject-matter expert in forestry, and Cooperative Extension Agent Martha Mobley, talk about and share tips during a forestry and pecan orchard tour last week. The free event drew dozens of people to area tree farms and orchards. Who is backing whom in sheriff’s race? LOUISBURG — Following a wild run for the party primary, the lines for the sheriff’s race are set with an incumbent set to do battle against a former employee. 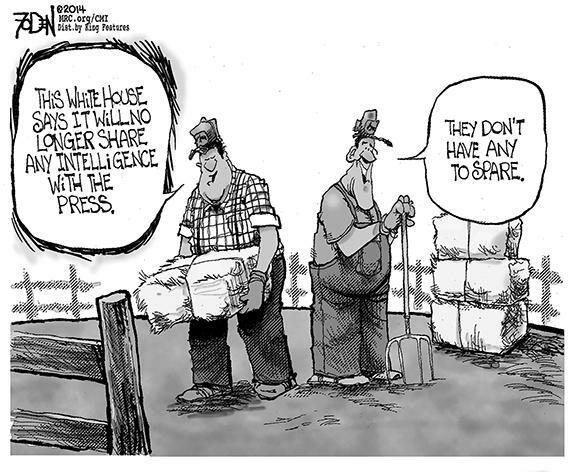 They both might get a bit of help in November from those they vanquished in the May primary. Jerry Jones nabbed the Republican party nomination, beating out challenges from Tom Hawley, William Mitchell and Rodney Shearin. A Confederate Monument centennial celebration will be held on North Main Street in Louisburg at the monument near the Louisburg College Taft Building on Saturday, May 17, at 1 p.m. The Regimental Army Band will start playing at 12 p.m. and the ceremony will start at 1 p.m. The Franklin Rifles #310 SCV will be in charge of the program. YOUNGSVILLE — Shortly after the police chief and town administrator clashed over a working arrangement, and after about 30 minutes of meeting behind closed doors, commissioners gave the mayor temporary authority to investigate a grievance, apparently filed against the town administrator. Town staff would not reveal who filed the grievance or the nature of the allegation. YOUNGSVILLE — Commissioners discussed water, beer and human resources during its May 8 board meeting. Earlier this spring, E. Franklin Street resident Laurine Young told commissioners and town staff that water running across town property floods her yard and threatens the foundation of her home. Town staff tried to determine if the state was responsible for the fix and town engineers were tasked with developing a solution. 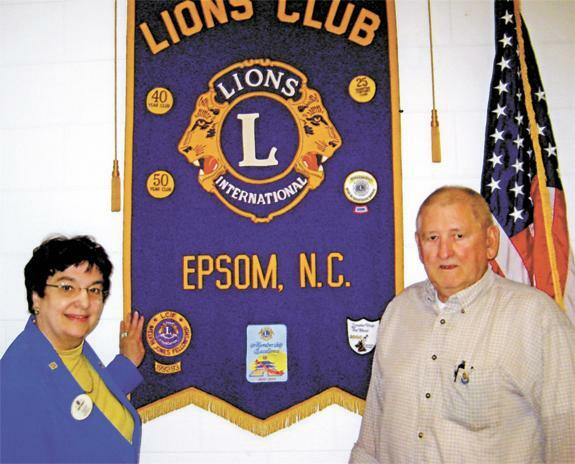 The Epsom Lions Club met recently to hear District Governor of 31-G, Cassandra Scarlette. She spoke of the many projects going on now and the need for more members to help with projects. Shown here are District Governor Scarlette and Durwood Daniels, club president. As part of National Emergency Services Week, which is May 18 to 24 this year, a special recognition ceremony is planned for Saturday, May 17, at Louisburg High School Auditorium. The event is to run from 6 to 8 p.m. and the public is invited.